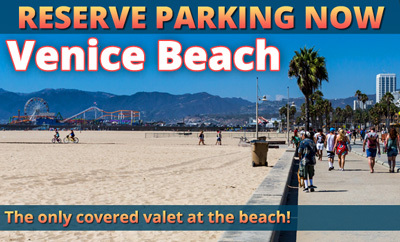 Parking.com offers convenient beach parking for Venice Beach. Valet parking is available at Hotel Erwin, located at 1697 Pacific Ave. This is the only covered valet available in the area, and is directly next to the beach! Venice Beach is a buzzing beach town known for its bohemian spirit. Stretching approximately 1.5 miles along the Pacific Ocean, the boardwalk is the site of many funky shops, street performers, and public art murals. There are restaurants offering a variety of cuisines, trendy coffee shops, and plenty of entertainment ranging from fortune tellers and mimes to jugglers and jesters. Also located at the boardwalk is Muscle Beach, handball courts, paddle tennis courts, a skate park, and numerous beach volleyball courts.